Bloodstone is the mineral heliotrope, also known as Jasper. It is a type of quartz that is characterized by its distinctive black, red and green colouration. Bloodstone has been used for carving signet rings and other objects since antiquity, and legends accord it many magical powers. 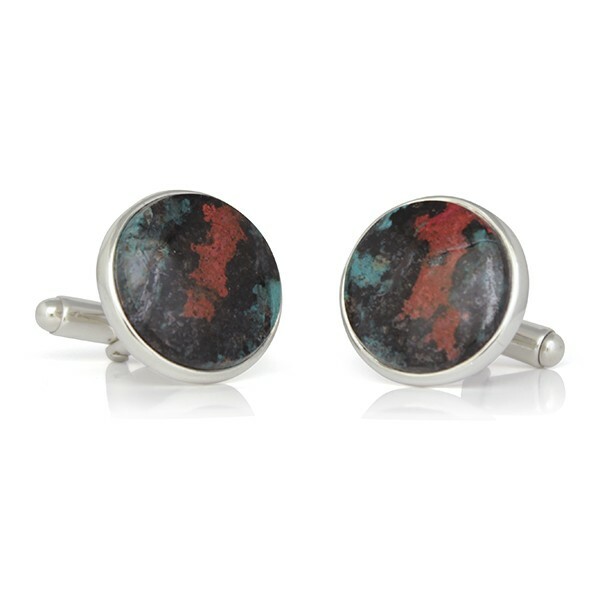 Bloodstone is also one of the traditional birthstones for March. I was attracted to these colourful pieces of bloodstone at the Tucson gem shows because I liked the balance of the red black and green in them. I brought them back with me and we hand-fabricated them into sterling silver cufflinks in my studio in Toronto.